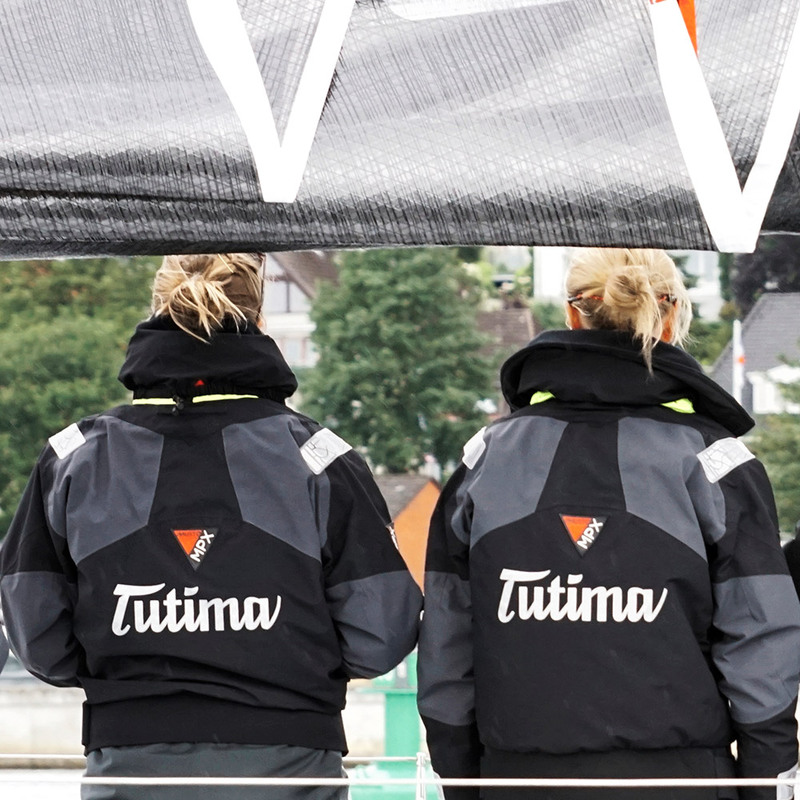 14 meters long, 8.6 tonnes, 257 square meters of sail area and a mast height of 23 meters: facts like these make sailors’ hearts beat faster – especially when those hearts belong to the members of the all-women crew who have made the “Tutima” yacht into their second home. Her real name is Kirsten, but everyone calls her “Kirsche” (“Cherry”). She began sailing soon after she first saw the light of day. An experienced helmswoman of an all-women crew since 1994, she has successfully competed in numerous national and international regattas and championships. After 12 years aboard a J24 and four years aboard a Bashford41, she was entrusted with the responsibility of serving as the skipper of the “Tutima”. With nothing but a few sailing experiences from her teenager years, this native of Rendsburg began regatta sailing somewhat late in life. 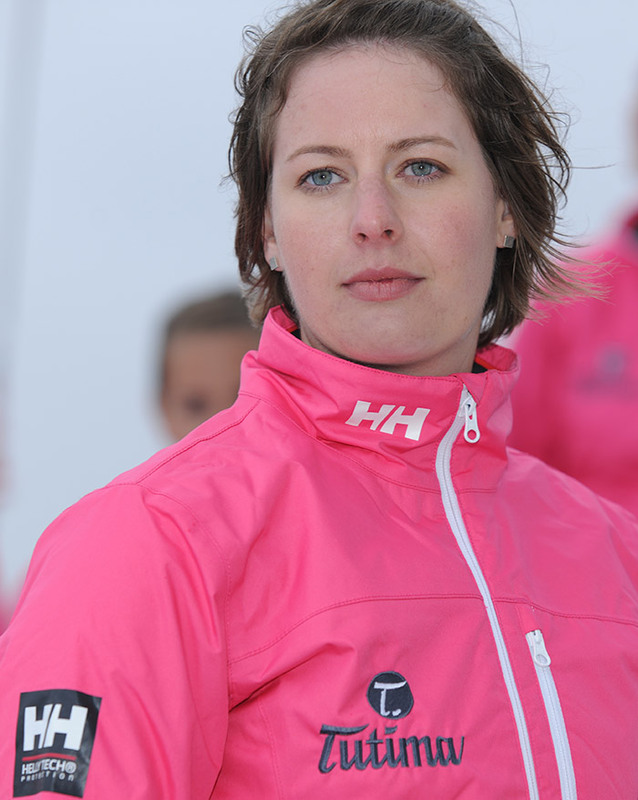 Nicknamed “Heidi”, she pursues a career in event management and is the organizational talent among the Tutima’s crew. 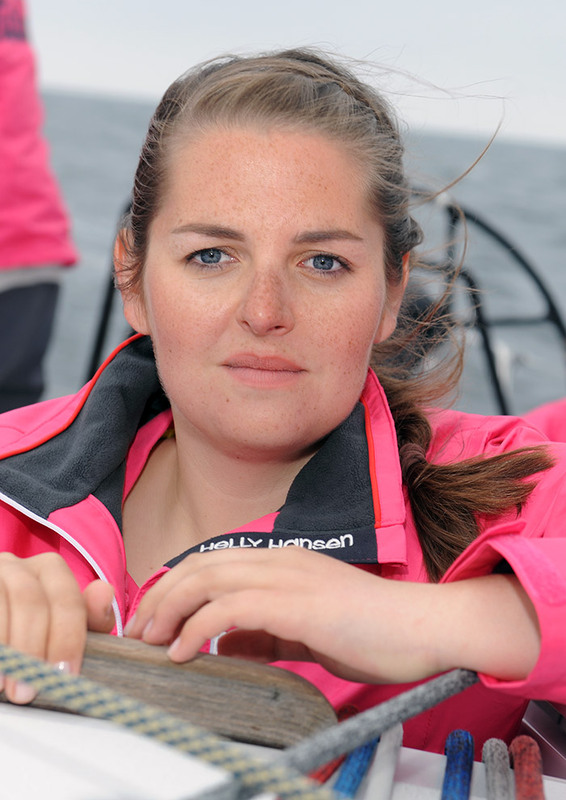 “Reggie” has known that “sailing + pink” is a good combination ever since she was a schoolgirl, when she sailed countless regattas on the Baltic aboard her club’s pink “youth ship”. These were followed by exciting seasons aboard the X99 and missions in J24 and J80 crews. 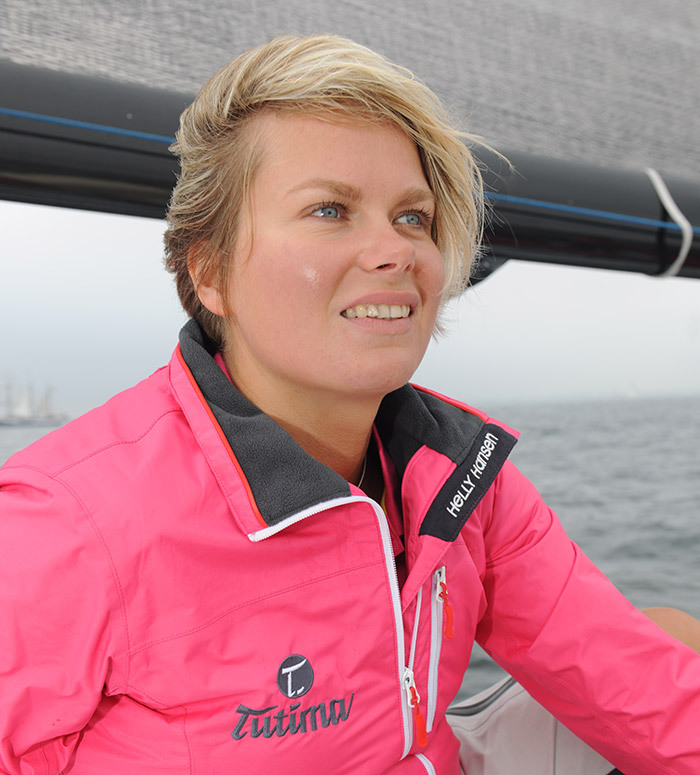 Keeping loyal to the pink hue, Reggie is looking forward to sailing at full speed aboard the Tutima racing yacht. “Kiwi” began sailing during a stay in New Zealand in 2009. She later gained additional experience in 420ers and aboard big ships. 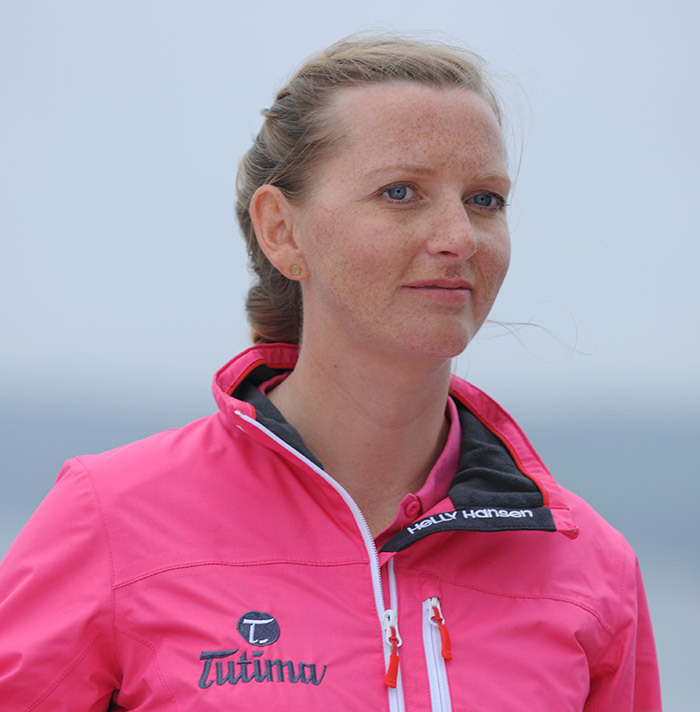 She has shared her passion for sailing with the crew of the Tutima since 2011. Having spent just a few days at sea, this native of Hamburg became infected with the sailing virus in 2006. 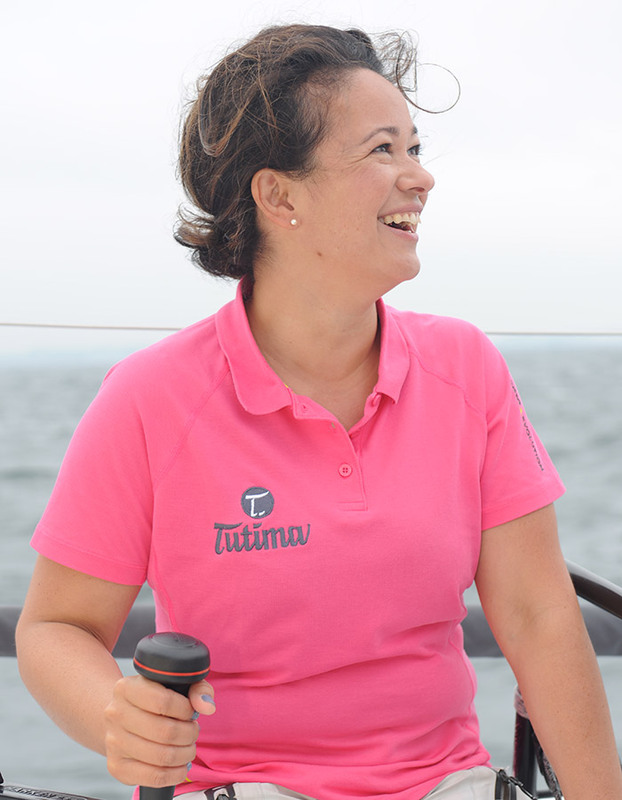 After sailing training, initial regatta experiences aboard pirates, several seasons with a J24 and Platu 25 as part of an all-women crew, diverse guest appearances in high-seas regattas, and three seasons aboard the X332 “Rubix”, “Mini” is happy to be sailing as part of the crew of the Tutima. This Berliner was born into a sailing family and learned to sail in early childhood. She soon realized that she wanted to combine her hobby and her career, so she became a sailmaker. 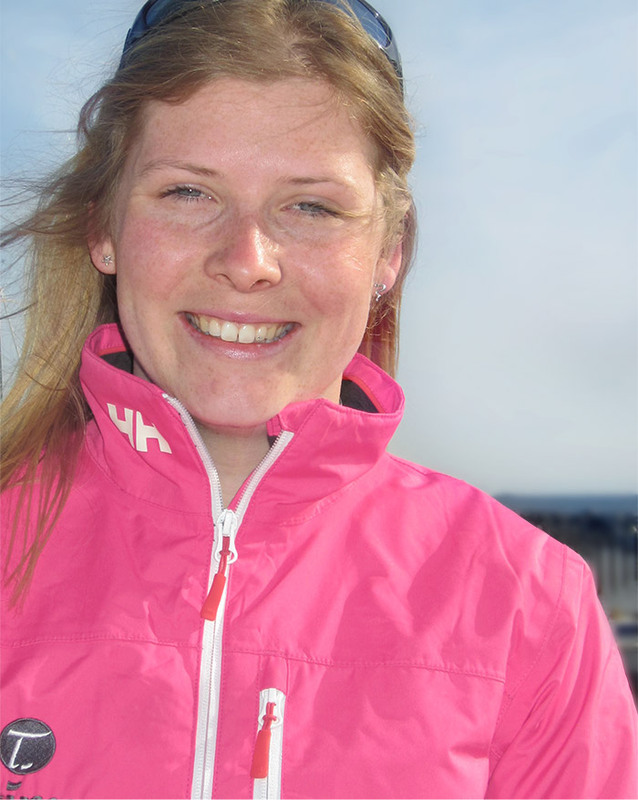 As a former competitive athlete, Kerstin sailed in the Olympic Women’s Match Race discipline until the beginning of 2012. Water is Katha’s element. She gained her first sailing experiences aboard a Laser Bahia on the Alster, followed by cruises with her family. She guarded German beaches as a DLRG lifeguard for many years. 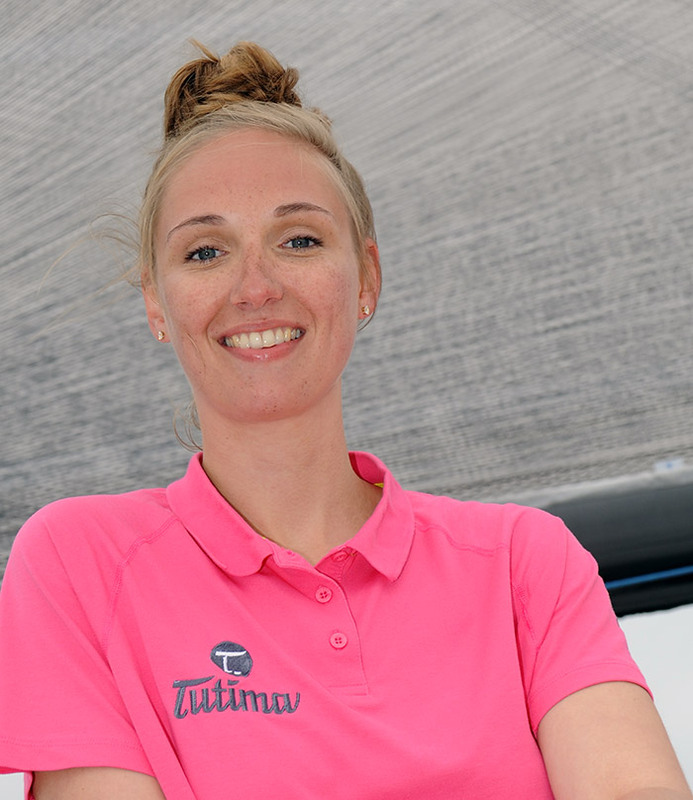 She switched from the sunshine of the beach to the spray aboard the Tutima in 2016 – and has had “nothing but sailing in her head” ever since. Profession: bank clerk | B.Sc. 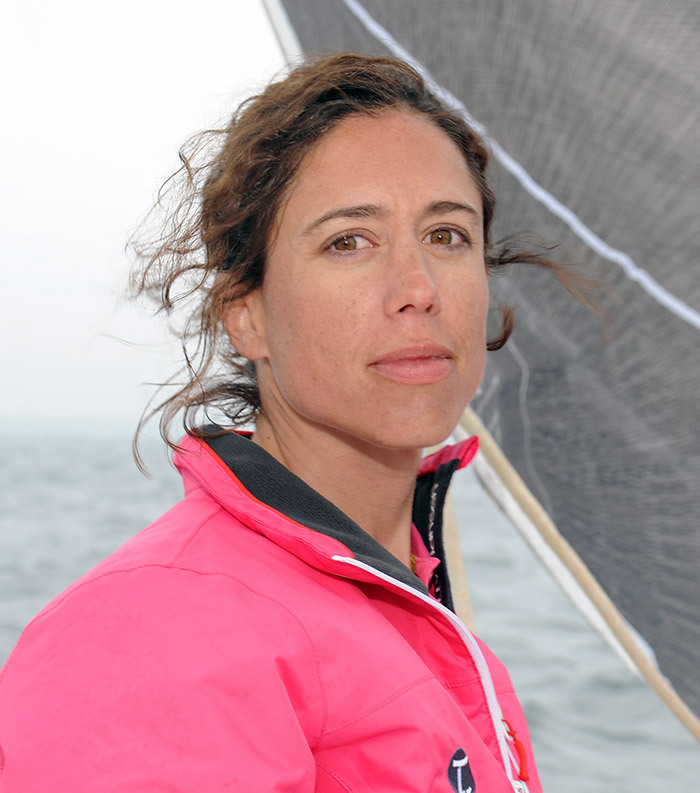 Born in Mexico, “Ari” discovered her passion for sailing at age 15. She gained her first experiences aboard a J-24. She was a member of the only ORC Mexican women’s sailing team in 2005, participating in various regattas in the Pacific. She also sailed aboard the Tutima’s sister ship on the Mediterranean. 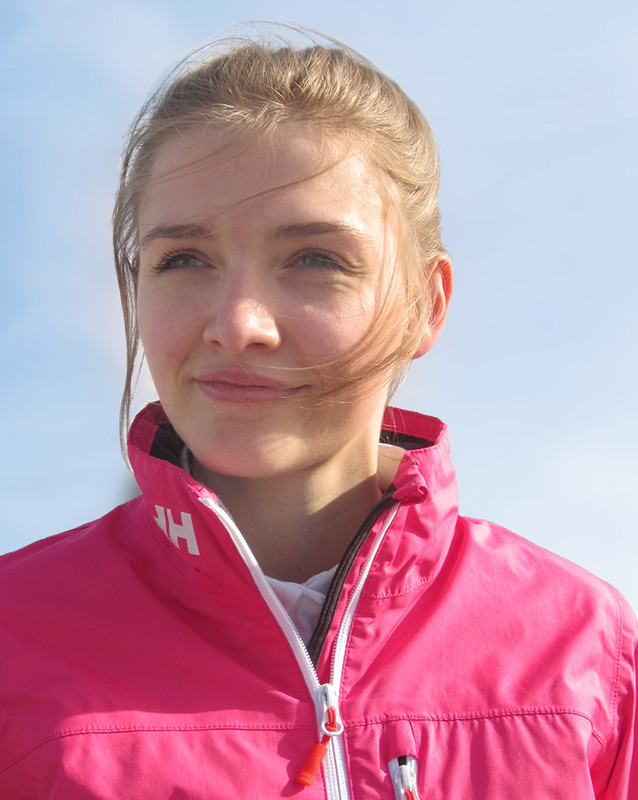 Before Svenja began regatta sailing in 420ers as a teenager in a sailing club in Hamburg, she had already gained her first sailing experiences aboard her parents’ boat during many sailing trips on the Baltic. The 420er was followed by a very instructive time in Match Race and the J24. Anyone who was born on the island of Föhr cannot possibly avoid contact with water. 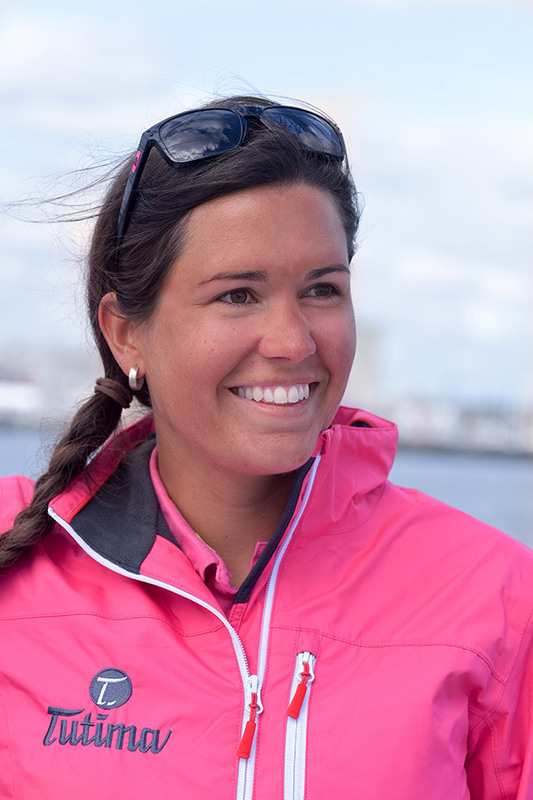 Lina began opti sailing at age five and later came to pirates, where she gained her regatta experience. After smaller missions aboard the Platu 25, Lina has enjoyed sailing aboard the Tutima since 2015. Annika made her first heroic attempts at sailing aboard her opti “Käptn Schlotterbein” and has remained loyal to water sport ever since. This student enjoyed many lovely sailing evenings on the Alster aboard the wooden pirate that she restored. 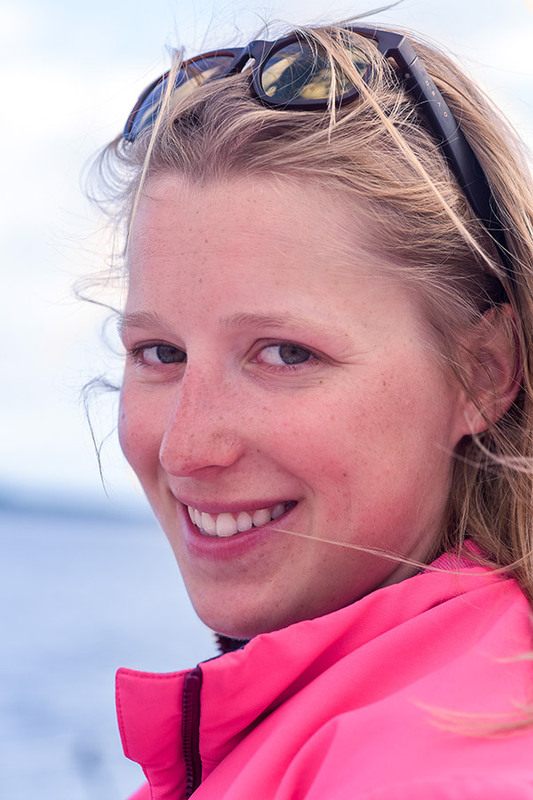 She first came aboard the Tutima early in the summer of 2011 has been part of the crew ever since. Many sailors experience stress during demanding situations like the last five minutes before the start of a race, but Laila finds these situations relaxing because they enable her to forget all about the stresses and strains of daily life.